Recently, I have found myself becoming more and more intrigued with various fabric printing techniques. 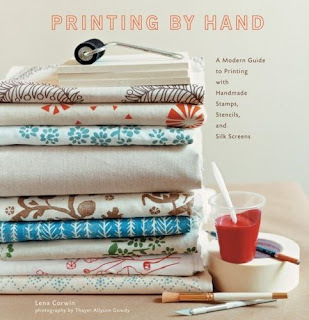 I had heard many positive things about Lena Corwin's book, Printing by Hand, and decided to add it to my collection. From the second it arrived on my doorstep, I found myself pouring over the pages of projects and gathering my "supply list". Not only are the photographs beautiful to look at but the instructions are clear and offer troubleshooting techniques. The degree of difficulty ranges from the very easy (printed stationery) to the more complex screenprinting projects at the end. Printing by Hand, is all about printing with stamps, stencils and silkscreen. It is chock-full of ideas including printing stationery, bed sheets, napkins, t-shirts, and furniture. I'm truly looking forward to tackling some of these projects and will be certain to share my results. If you are at all interested in these techniques or even just print and pattern, I highly recommend adding this to your collection. I've done this style of screen printing using the rubber block. It's very easy to do and a lot of fun. I'll have to check out this book! I would love to learn some new techniques.